The principal or "first chair" players of any major orchestra are talented enough to have solo careers of their own (and some do, on the side), yet somehow they were drawn to devote the better part of their energies to being one among many. It is important that we recognize these master musicians too. Older collectors will remember that the Philadelphia Orchestra and Columbia Records once devoted a series of LPs to that ensemble's first chair players. 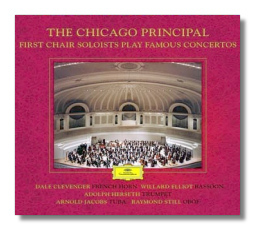 Now the Chicago Symphony Orchestra and Deutsche Grammophon have done something similar with the present release. Unlike the Philadelphia series, however, these performances were not recorded specifically for this collection. The Mozart and Haydn recordings (all with Abbado on the podium) were made between 1981 and 1984. The Britten (with Giulini and tenor Robert Tear) comes from 1977, and Ravel's Boléro, with Solti, comes from 1976. Barenboim's Schumann and Vaughan Williams date from 1977. With the exception of the Boléro (originally released by London/Decca), these recordings were taped for Deutsche Grammophon, although I think some have them have not been released on CD until now. The Mozart and Haydn readings are the soul of straight-ahead conservatism. Enjoyably old-fashioned, they are innocent of any revisionist or period-performance musicianship. The soloists do little to personalize these works, but there's no denying the technical accomplishment and good taste on display here. Robert Tear banishes memories of Peter Pears no more than Dale Clevenger eclipses Dennis Brain, yet Giulini's reading of Britten's Serenade is a good one. The Vaughan Williams, on the other hand, is truly fantastic; Arnold Jacobs plays with jaw-dropping virtuosity, and there is no shortage of personality here. The Schumann is highly enjoyable as well. As for the Boléro, Solti gets the tempo right (14:50 is the timing), and if he emphasizes color and spectacle over a darker undercurrent, no one will leave this collection behind feeling depressed. Digipak packaging and a booklet that gives the soloists their due add to the attractiveness of this release. I feel this set is destined to be collectible, so don't hesitate if you have any interest in the musicians, the music, or the worthwhile concept. Dale Clevenger, principal horn of the CSO since 1966, is featured in Mozart's Horn Concerto #3, with Claudio Abbado conducting (1981); Schumann's Konzertstücke in F Major for Four Horns and Orchestra, with Daniel Barenboim conducting (1977); and Britten's Serenade for Tenor, Horn and Strings, with Carlo Maria Giulini conducting (1977). Arnold Jacobs, the CSO's beloved principal tuba until 1988, performs on a 1977 recording of Vaughan Williams' Concerto for Bass Tuba in F minor, conducted by Daniel Barenboim. The CSO's prinicpal bassoon from 1964 until his retirement in 1996, Willard Elliot is featured in a 1981 performance of Mozart's Bassoon Concerto, with Claudio Abbado conducting. Adolph Herseth, who served as the CSO's principal trumpet for an unprecedented 50 years, and currently performs as principal trumpet emeritus, performs in a 1984 recording of Haydn's Trumpet Concerto in E Flat Major Major, conducted by Claudio Abbado. Ray Still, who performed as principal oboe for forty years, completes the CD set with his recording of Mozart's Oboe Concerto in C Major, conducted by Claudio Abbado (1983).